We’ve been following Facebook’s journey to becoming a social marketplace, which enables e-merchants to sell their products directly within its platform, for several months now. This week, the social network has got us talking again, with the launch of its latest features. This is not Facebook’s first attempt at online shopping. The social network has been trying to integrate ecommerce into its platform for several months. To successfully carry out its strategy, Facebook has already incorporated a number of features, some of which are still in test phase. Among the existing initiatives, we can find “Dynamic Product Ads,” the addition of a “Buy” button, the creation of ecommerce “mini-sites”, the “Business on Messenger” feature, and the integration of a virtual shopping assistant. In order to create more exchanges between brands and users, Facebook continues its online shopping offensive. 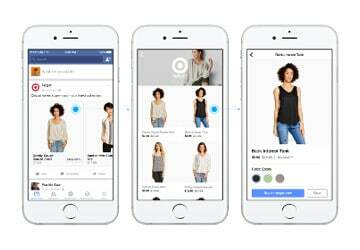 On Monday, the social network announced new mobile devices improvements: a new ad format called “Canvas”, the “Shop” section unveiled in September on Facebook pages and a new “Shopping” feature. Unveiled last June, this ad format allows you to view products interactively and in full screen mode in the Facebook mobile app. Following the improvements made by the social network, this format will enable the platform’s members to browse advertisers’ product catalogues after clicking on an advert. The catalogue will show products similar to that initially advertised. With “Canvas”, users benefit from a fast load time and from optimal user experience and visibility. Users can then go to the advertiser’s online store to finalise their purchase. 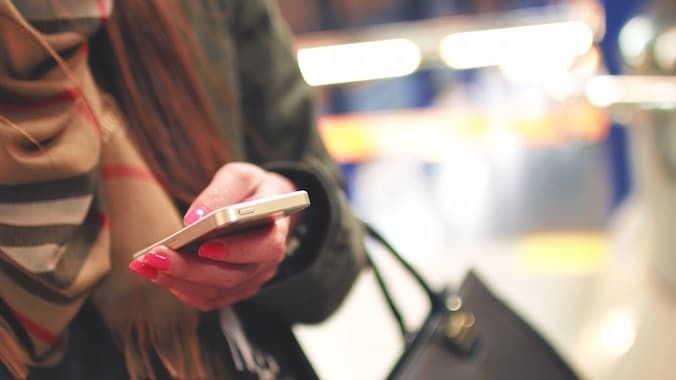 This new feature will overcome the pipeline dropout problem, due to users not being able to easily continue to purchase stage after clicking on an advert from their mobile device. This was due to really long loading times of non-optimised mobile websites. With over a billion visitors on Facebook each month, users are turning increasingly to companies’ pages to obtain information and discover their products. To provide more resources to the merchants, the social network decided to integrate a “Shop” section to its Facebook pages a few weeks ago. The section will allow merchants to present their product catalogue to the platform’s members. With this new “Shop” section, merchants will have two options. If they want to keep their site traffic they can link the section to their online store. Those who want to minimise the stages of the customer purchase journey, will be able to sell their products directly within their Facebook page. For this, tester merchants are already able to upload their product catalogue directly on Facebook, bypassing the previous requirement of using Shopify. Facebook will not take any percentage on sales made. 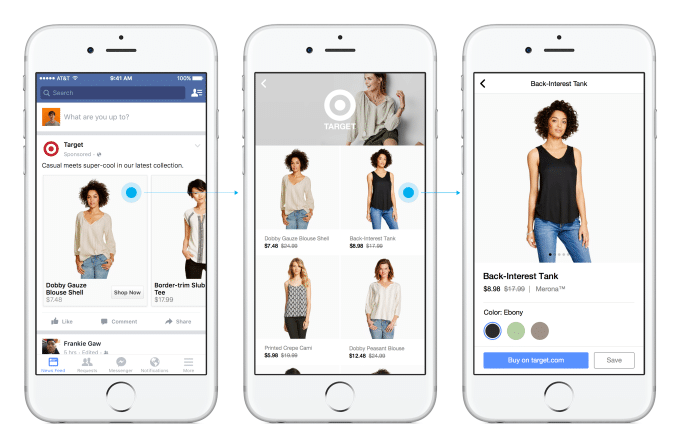 Throughout this new section, Facebook wants to facilitate the user’s journey and shopping experience in its mobile application. 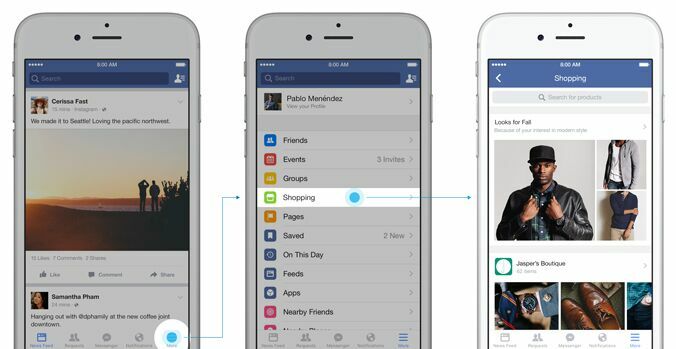 This week, Facebook also announced a new “Shopping” feature, which will be integrated in the application’s menu. This space will allow the platform’s users to discover, share and buy products more easily from the mobile application. The Facebook algorithm will offer products based on the pages users have “Liked” and also on the content and advertisements they have interacted with. Ultimately, Facebook plans to offer additional content such as products on sale in Facebook groups. These new features are currently undergoing limited trials in the United States. The new ad format, “Canvas”, will enter test phase in the coming weeks. The “Shop” section is currently being tested by a small number of companies. The “Shopping” feature, which will be released in a few weeks, will in turn be tested by the same companies as those that are currently testing the “Shop” section.